Houston’s nationally acclaimed Journey tribute band is back on April 27th, 2019! Out of stock! 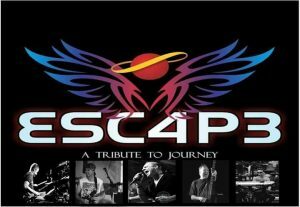 Reserved Ticket- ESCAPE $25.00 Reserved Seating provides a table and chair. Per person ticket. Please note in the order notes section who you would like to sit with, or we cannot guarantee seats together. Unlimited available	 General Admission- ESCAPE $20.00 Please bring a lawn chair. Any available tables on the day of the concert are on a first come first serve basis. Unlimited available	 Child's Ticket- ESCAPE $0.00 For kid's 12 years or younger. A chair is not provided with a child's free ticket. Please feel free to bring a kid's chair to add to your table.